Miles is voiced by Shameik Moore (“The Get Down”), and several other cast members have now been announced. Jake Johnson (“New Girl,” “Jurassic World”) is joining the cast as Miles’ reluctant mentor, Peter Parker, with Liev Schreiber (“Ray Donovan”) playing the larger-than-life crime lord Kingpin, Hailee Steinfeld (“Pitch Perfect 3”) playing the spunky, free-spirited Spider-Gwen, Oscar® winner Mahershala Ali (“Moonlight,” “Marvel’s Luke Cage”) as Miles’ influential uncle Aaron, Brian Tyree Henry (“Atlanta,” “Hotel Artemis”) playing Miles’ father Jefferson, Luna Lauren Velez (“Dexter”) as Miles’ mother Rio, and Lily Tomlin (“Grace and Frankie”) as Aunt May. The LEGO Movie, 21 Jump Street, and Cloudy with a Chance of Meatballs directors Phil Lord and Chris Miller executive produce this latest Spider-Man adventure, with Lord writing the screenplay. The movie is directed by Rise of the Guardians director Peter Ramsey, and 22 Jump Street writer Rodney Rothman, and The Little Prince writer Bob Persichetti. 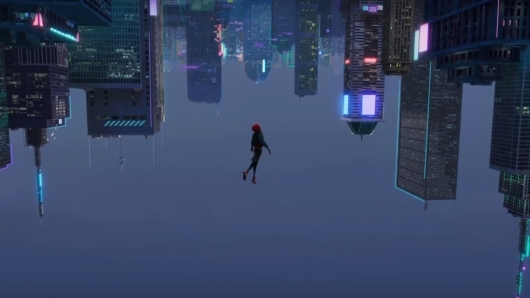 Spider-Man: Into the Spider-Verse will be released in theaters on December 14th.